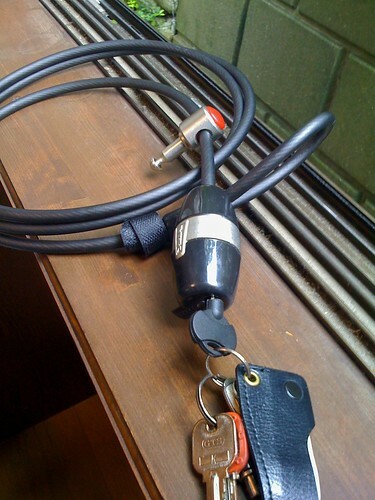 I got a new bike lock from YPK Innovations - a Cafe 2.0, because the old one had a couple of problems. The plastic bezel around the lock broke, exposing the metal lock. The metal collar inside, around the lock itself started to rotate, covering up the hole that the post was supposed to be inserted into. I think the one I just bought is a generation old, but it still seems better than the first one. These YPK “cafe” locks are nice because you can make two loops for flexible locking.